Tata Tea Jaago Re 2.0 is back with another campaign that talks about the need for gender sensitization. It takes forward the conversation on ‘Preactivism’ with regard to the issue of women’s role in the society . The film makes us aware of instances of gender inequality that can take place even in our own homes. It holds a mirror to our day-to-day lives and highlights how we as a society, treat our girls and women differently, sometimes simply because we are conditioned to do so. With this film, Jaago Re hopes to tackle the issue of women safety by addressing its root cause – gender inequality. This inequality is imposed on girls at a young age and continues into adulthood giving men the mistaken notion that they are superior to women. This film brings to the forefront, the biases and stereotypes we unconsciously impose on young children that then continue into adulthood. It is this problem that Jaago Re aims to make parents conscious of and play an active role in addressing. We need to work towards creating a more gender-sensitive environment. Conceptualized by Mullen Lintas, the film opens with a young girl asking her mother for permission to go out and play badminton with her brother. However, her mother refuses citing that she needs to stay back and learn to cook lest her future in-laws complain that her mother hasn’t taught her anything. Her brother, on the other hand, is encouraged to go out and play with his father. Jaago Re hopes to address this issue at the grassroot level by urging people to sign the petitioning HRD Ministry to make gender sensitization compulsory in schools. 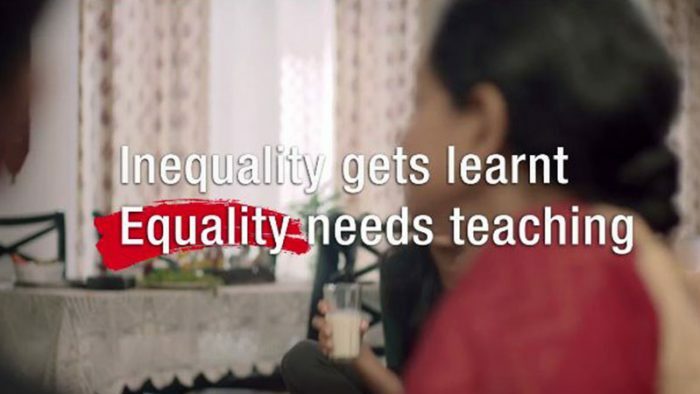 The campaign also encourages parents to take a personal pledge to practice and teach gender sensitivity to their children at home. Since its launch, over three lakh people have joined the Preactivism movement by signing the petition to bring about a change with regard to Women Safety.